This article contains the stats, strategy, and guide for Rider - Boudica. We will update this as soon as the game comes out. 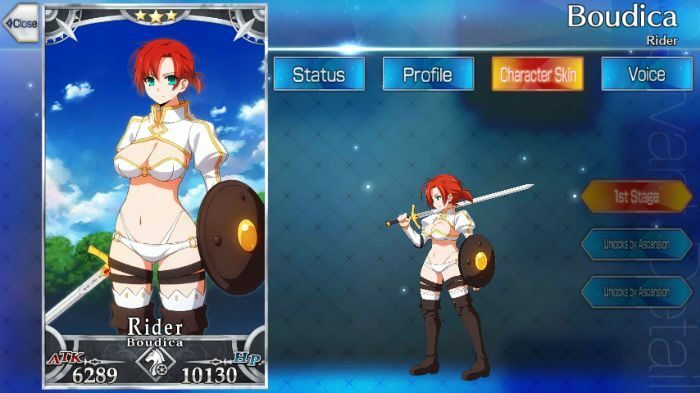 This article contains the skills, stats, growth, and ability of Boudica of the Rider class from Fate Grand Order [FGO]. Boudica is a decent defensive support Servant, excelling at boosting Arts card performance for the party and buffing DEF. With 2 Quick Cards and 2 Arts Cards, she’s best with either Arts-heavy or Quick-heavy parties, performing consistent Quick Chains or Arts Chains. When leveling up her skills, Andraste’s Divine Protection is the most important, because it allows her to greatly strengthen an Arts-heavy party. Vlad III is a perfect partner for Boudica. She can cover for his defenses and boost his Arts even further, while he takes care of the offense for the team. Again, Andraste’s Divine Protection is the most important skill for this party, and Chariot of Boudica should help Vlad survive more hits. Both units can apply Guts status on themselves, too, allowing both of them to survive even the worst attacks. Boudica can also function well with various Caster-class Servants. They can cover her weakness to Assassins and make use of her Andraste’s Divine Protection quite well with their various Arts attacks. Medea is a good example of an offensive-type Caster that appreciates the boost to her Arts power and buff to DEF. Hans Christian Anderson, on the other hand, can stack multiple DEF and ATK buffs alongside Boudica. On the other hand, combining her with Mash Kyrielight can form an absolute defense party. With Chariot of Boudica and Mash’s Wall of Fuming Chalk and Wall of Brittle Snowflakes combined, the party will be nearly invulnerable to most damage. This combination is ideal for strong, hard-hitting bosses, especially if Boudica and Mash have to protect a more fragile third party member. For her Craft Essences, Boudica will want to focus primarily on NP Gain, so that she could repeatedly buff her allies with Chariot of Boudica. Divine Banquet is generally one of the best Craft Essences for NP gain, because it boosts NP generation by 25-30%. Alternatively, Prisma Cosmos can be used to regenerate some NP every turn. If it’s more important to use her Noble Phantasm as early as possible, Kaleidoscope can let her start the battle with her NP gauge at 80-100%. The Imaginary Element and Plentiful Harvest are weaker, but more common alternatives. Vow to the Goddess B 3 7 Increases own attack against Roman enemies for 3 turns. Andraste’s Divine Protection A 3 7 Increases party’s Arts card performance for 3 turns. Further increases party’s defense for 1 turn. Known and hailed as the Queen of Victory, Boudica led a revolution of kings against the conquest of Emperor Nero. However, she ultimately failed. Despite her failure, many people retold her tale as she passed into legend as a fighting queen. Furious over her daughters’ and her disgrace, she resolved to retake Britannia from Rome no matter what happened. Boudica loved everything there was to Britania. The fields, the gardens, and its people – she would fight for it no matter the cost. When her husband died, she took on the mantle to fight. After all, what kind of queen would Boudica be if she didn’t fight for her people? When Boudica passed on, she watched the rise and fall of Britannia. She also had a special spot in her heart for the Britannic heroes such as the King of Knights.